James became interested in pursing a career in physical therapy after having to have a rotator cuff repair at age 15 following a sports injury. He experienced the benefits of physical therapy first hand during his rehabilitation process from that surgery. James also went through physical therapy after being in a few severe motor vehicle accidents. In 2012, James earned his Bachelors degree in Kinesiology with a pre-physical therapy focus and a minor in chemistry from Western Washington University (WWU). He went on to earn his Masters in Science in 2014 also from WWU. Having grown up in Washington and loving the access to the outdoors and good coffee, James decided to stay in the area to pursue further education, earning his Doctorate in Physical Therapy in 2018 from the University of Washington. Upon graduating, James knew he wanted to continue developing his clinical skills, which lead him to pursue an orthopedic manual therapy residency/fellowship through the Ola Grimsby Institute. 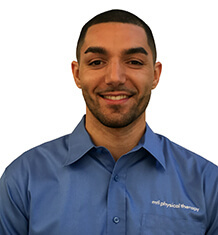 In 2018, he joined the team at MTI Physical Therapy in Fremont. James has a passion for helping others from all walks of life to optimize health and performance so that they can enjoy their daily activities and desired athletic endeavors. He strives to empower his patients through intelligent rehabilitation that focuses on education, manual therapy and exercise.